A reliable and easy to use therapeutic massage chair has been in demand for years for nail salon use. Unfortunately, that simple request for a high quality massage chair has been hard to impossible to find. After many requests from nail salons owners, the technologies company, Luraco Technologies has developed a high quality massage chair with unique features specifically for nail salons. Designed for the 8-10 hour a day demands of nail salons, the iRobotics is up to the grueling test. The problems of broken mechanics, faulty remote controls, and break-downs are virtually eliminated with the iRobotics self diagnostic system. The system notifies the user via an LED display of the internal status of the system. If for example, an LED identifies a problem with the remote control, the remote can be easily replaced. The same is true for other common failures of massage chairs. So, there is no need to send the entire chair off for maintenance when a simple reboot of the mother board or remote replacement will solve the issue. Some of the advanced features include; full function massage system, Swedish and Shiatsu Massage, self diagnostic system, military grade components, replaceable remote control, removable chair back, replaceable control box, integrated MP3 player, laptop holder for mini laptops, and high reliability. 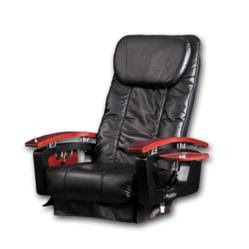 Shop Salon Massage Chairs for LE$$ / Price list Click here!